New plying trick saves time! I’m still looking for the perfect name for this colorway and just wanted to get an update out before I go lie down for a bit. I got the first ball plied. 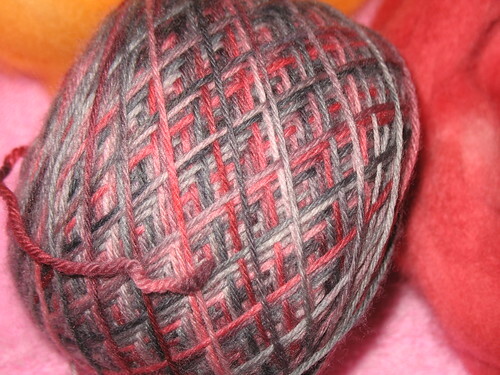 I didn’t Navajo ply as I normally do because I didn’t want the yarn to bulk up too much. I have a REALLY small orifice on this wheel. Navajo plying tends to get the wool stuck. The only problems I ran into here was that my bobbin was just way too small. I had to remove the drive band and hand wind the yarn on since the bobbin was so full it was getting stuck on the flyer. It took much longer. I hope something can be done about the size of my orifice and flyer/bobbins soon. I discovered a new trick (or at least new to me) for plying. The benefit of Navajo plying is that you go from one bobbin to one bobbin. You never run the risk of running out of yarn on one side and having a ton left on the second bobbin like you would doing a traditional ply using a lazy kate and multiple bobbins. I took the single I’d spun and ran it through my wool winder to make a center pull cake. Then I spun in the reverse direction (like for all plying techniques I’m aware of). The trick is, I spun the inside pull strand of the cake to the outside strand of the cake. You do have to be careful the cake doesn’t spin in circles on the floor tumbling around and tangle itself, and the last few yards takes more concentration, but all-in-all it worked fantastically well. You work with the inside and outside pull strands of the cake just like you would use the two strands coming off the lazy kate. When you reach the end of your plying, the end just forms a loop and so far seems to hold the twist better than just plying two cut strands together. The loop on the end prevents much twist from running off the end of the finished yarn. 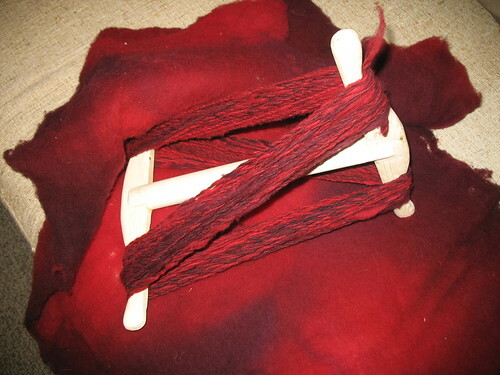 This also produces just as great of a balanced yarn as does traditional plying. The benefit of never having to worry about having one bobbin still partially full is awesome AND you don’t have to wrestle with the awkward and slightly bulkier Navajo plying. 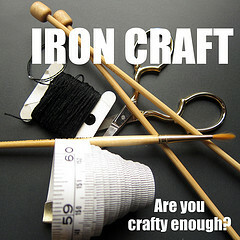 Get out your wool winders and put them to use in your plying! I’m interested to hear how it works for you. I know this will be a huge future time saver in my plying. I’ve just got to get a bigger bobbin and flyer to hold a full size hank. I estimate this to be about 72 yards of a varied weight yarn. It varies from a thin worsted like Cascade 220 to a thinner bulky, not anywhere close to a chunky yarn like Jiffy Thick and Quick. It has some thick and thin elements, but is a rather nice yarn. The slight barber poling really adds to the character. Some parts are entirely red, some entirely maroon, and some with the poles. I really love this yarn. It’s going to be a hard one to part with. I’d love to see it in a hat and scarf set once I spin up the other batt. Just imagine it with a charcoal pea coat and snow flakes beginning to cling to the ever so slight halo of the yarn. I’m going to wait until I have a bigger flyer to spin up the rest, hopefully tomorrow…or rather later today. It seems I forgot to sleep once again. Today I got to do one of those things that makes me feel very spoiled and exceptionally happy. Yes, people who miss having things like a home can still feel really spoiled like the world revolves around them. It’s just really rare when you can forget about all the lame stuff for long enough AND get hit with the awesome bits of the world all at once. Table Rock Llamas is one of those stores that does it for me. The only time the attacks of the lame hits me at that store is when I realize I can’t afford to take everything home with me. When I went today, I took some of my profit from my etsy store and reinvested it in building the best fibery store ever, my own! 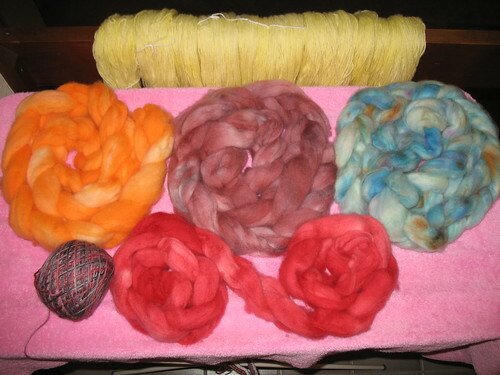 I got some fiber to spin art yarns since I’m itching to add them to my store and a batt that was in the oops pile. I’ve never spun from a batt before, only rovings. I really want to buy a drum carder and start a batt of the month club for spinners with the same funky tastes as myself. Basically, spinners who want alien batts, Dr. Who themed batts, hippie batts, and periodically just beautiful flowery batts. 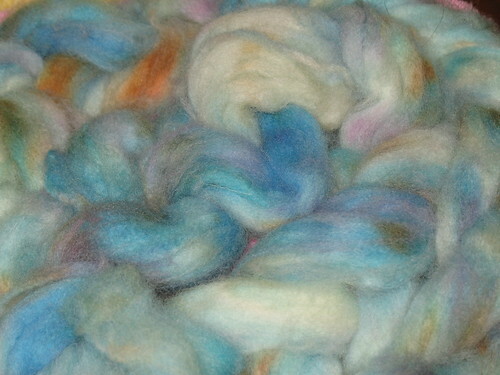 Naturally, it doesn’t make any sense to buy a drum carder before you’re sure you can spin from a batt! I hunted through the rack of batts and didn’t see any in colors that struck me. Then as I was having my various art yarn fibers weighed out and priced, I saw a pile of some of the most beautiful batts I’ve ever seen in the store. None were priced, and I fell in love with an interesting red one. When I asked, I learned that this pile is the “oops” and “I wonder what happens when I…” pile. Naturally, those would be the ones that appeal to my taste! 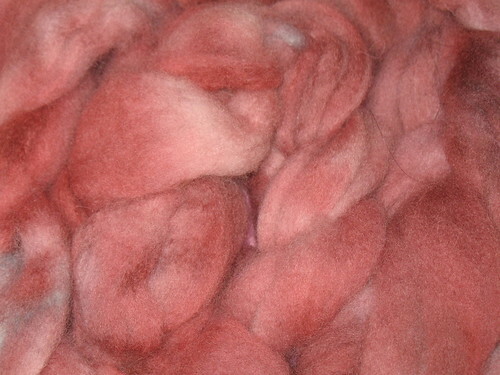 Plus, it was priced like raw wool, aka cheaper than normal batts! 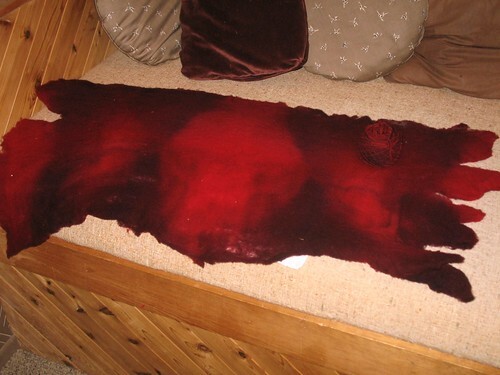 All I know is it’s a short staple length, red and darker red, dyed with acid dyes, and was meant to be brown. 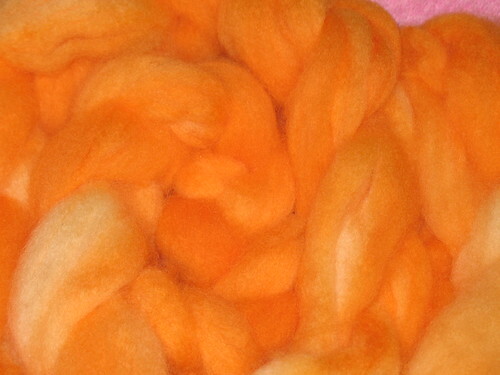 I’m busy spinning it tonight and trying to decide on a colorway name before it hits my etsy store. At first I was thinking “The Red Carpet” and including a star stitch marker or something. Now that I’ve begun spinning, I’m not quite sure anymore. 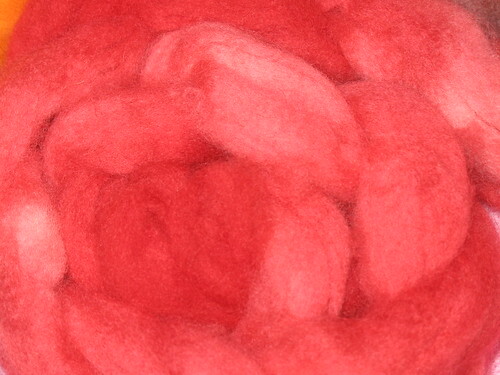 If you have any ideas on a great colorway name, leave it in a comment and you could see yarn with your name up on etsy! The Spinning Wheel We BUILT! I really wanted to spin, but couldn’t come close to affording a spinning wheel. I borrowed my friend’s Babe wheel and tried to make one like it. I made a few changed, like using a bike tire because that’s what I had. My bobbins aren’t plastic either, mine have a PVC tube for the shaft and wooden pullies on the ends. I tried to go for a steam punk look for my wheel. The spray paint was actually the most expensive part of the whole thing! 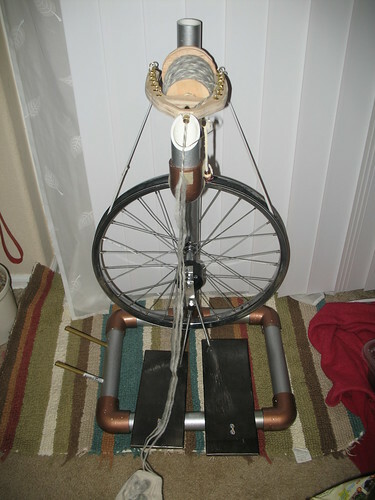 It’s not nearly as smooth as Kat’s and takes plenty of adjustments during a spinning session, but it’s so freaking awesome! I have a spinning wheel! I’ll be taking it with me on my trip to Arizona so I can spin in my down time there.